23 nominees across several sports have made the longlist for the award and the shortlist will be revealed next month. 23 nominees have been included in the longlist for the RTÉ Sportsperson of the Year award. 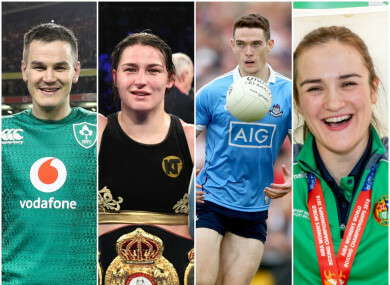 THE LONGLIST FOR the 2018 RTÉ Sportsperson of the Year award has been revealed, with Johnny Sexton, Katie Taylor and Dublin footballer Brian Fenton among the 23 nominees. The final shortlist will be announced on Sunday Sport on RTÉ Radio 1 on Sunday 9 December and the awards will be presented on 15 December. 2018 was an exceptional year for Irish sport as Joe Schmidt’s side secured Grand Slam success in the Six Nations, while the women’s hockey team enjoyed an incredible campaign at the World Cup. Graham Shaw’s charges defied the odds to claim a silver medal after reaching the final against the Netherlands. Meanwhile, it was also an exceptional year for the Dublin footballers as Jim Gavin’s side collected the Sam Maguire for a fourth consecutive year while the ladies team completed back-to-back All-Ireland success in Croke Park. The Limerick hurlers ended a 45-year wait for the Liam MacCarthy Cup, Cork retained their All-Ireland camogie title and Dundalk secured a League and FAI Cup double. Katie Taylor continued to dominate in professional boxing, while Kellie Harrington won a gold medal in the lightweight division at the AIBA Women’s World Boxing Championships. Cork sprinter Phil Healy enjoyed an incredible season on the track as she set a new national record over 100m and 200m, and Sanita Puspure won a gold medal in the women’s single sculls at the World Rowing Championships. Email “Sexton, Taylor and Fenton among longlist for 2018 RTÉ Sportsperson of the Year”. Feedback on “Sexton, Taylor and Fenton among longlist for 2018 RTÉ Sportsperson of the Year”.